On Sunday I crewed on a Mini in the largest sailing race in the world, the Barcolana of Trieste. There were three of us on board this 21-footer, designed for single-handed trans-Atlantic racing. I did cockpit. The 12 halyards and the control lines for the articulating sprit are all clutched to one central winch, and I was the halyard guy. 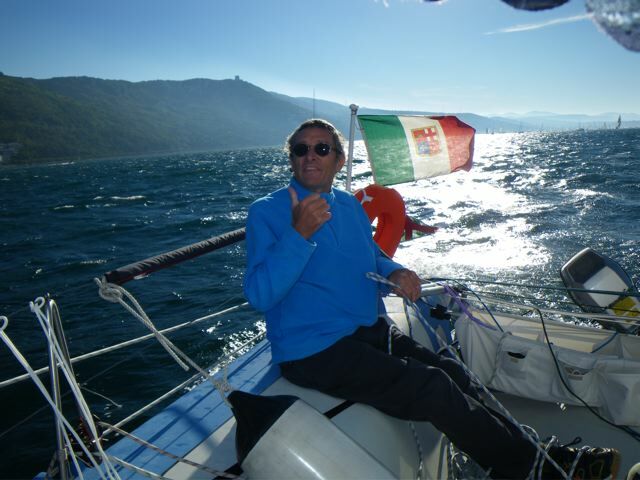 The day before, I memorized as many Italian sailing terms as I could. Then, not one clutch was marked. A 1.5-mile line with Coast Guard cutters at each end and a dozen mid-line buoys had all boats from all classes starting at the same time in 17 knots of wind on a beam reach. The line was so long that we did not hear the starting cannon until 10 seconds after the GPS start. A dozen maxi’s and several super-maxi’s just exploded off the line. We finished 566th out of 1850 boats (elapsed, 20 feet being the minimum length; no multihulls) and 8th out of the 44 finishers in our class. The Barcolana uses no handicaps; rather, divisions are based on boat length. We finished in 6 hr 15 min. The winning boat (the gorgeous 100-foot canting-keeled Alfa Romeo 2) did it in 56 minutes, averaging 17 knots on the course. The race was labor-intensive, with many sail changes. We had to fend off other boats countless times. Our skipper’s strategy was to make sure we pushed them aft. That’s skipper Franco Vaccari on the right. In our race together we had all kinds of wind. We were double reefed at the start, and had zero wind numerous times. There were giant shifts and sharp wind lines. We rounded all marks with our fenders in place. Incredible to be overlapped with 50 boats rounding marks; on two roundings we were the inside boat, rounding huge inflatable marks that were legal to rub. I saw at least a hundred collisions, none serious but many very noisy. At times, with no wind, many people just jumped off and swam around. During the race, people danced to boomboxes on their boats, drank champagne, demanded mark room or their rights (“Aqua! Aqua!”), yelled and cheered in many languages. One of our sprit control fittings broke 15 minutes after the start on a beam-reach with the giant spin up—a mess that cost us about 300 places off the line. Franco, the skipper, was eventually able to fix it, but at the first mark we were in about 1200th place (literally). There were so many boats at that mark we never even saw it; we just figured it was in the center of a clutch of maybe 500 boats. But we kept making money throughout the race, Franco reading the wind well and keeping clear of the massive barges formed by dozens of boats more or less stuck together. Every moment was scenic. 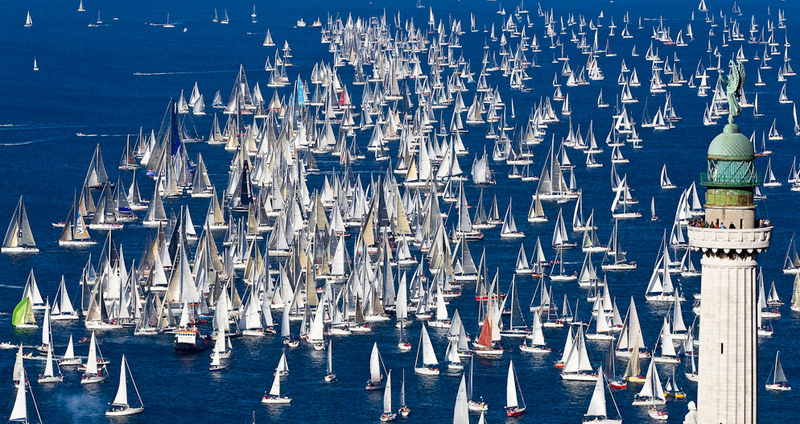 Who’s ever seen a thousand spinnakers flying at once? Castles. Monasteries. Snowcapped mountains. Beautiful sportboats. Intravenous beer after the race, then dinner with Franco at the home of my host and her family, sailors all. Trieste is one sailing-infatuated town. We watched the heli footage on TV. Only a heli would know if you were over early on this race. Officials at the Luderitz Speed Challenge in Namibia are reporting that kite sailor Alex Caizergues on Tuesday set a new World Speed Sailing Record at 54.10 knots. On his first run, at that. Details are a bit, ah sketchy, but the word is that a number of entrants have beaten the former mark of 51.36, which belonged to the giant trifoiler,l’Hydroptere. If you follow these things, you will recognize Alex Caizergues as one of the usual suspects, a man who has held the speed record before. Here he is, doing his thing: s the man in November, 2009 setting a record at 50.57 that held for a while Alex at Luderitz at 54.10. LANZAROTE, Canary Islands (13 October 2010) – The first three medals of the inaugural RC 44 World Championship for the Islas Canarias Puerto Calero Cup were awarded today in recognition of the match racing portion of the regatta. Jimmy Spithill and the 17 crew won the gold, Terry Hutchinson and Artemis the silver and Russell Coutts and BMW ORACLE Racing the bronze. Spithill, a winner in 2005 of the ISAF World Match Racing Championship, defeated Hutchinson 2-0 to claim the championship that began yesterday afternoon and concluded today. Both races were sailed in light, streaky winds. 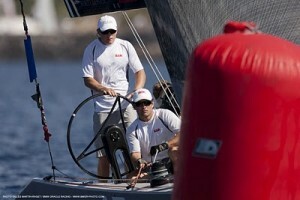 Spithill and 17 won yesterday’s race with breathing room, but were under pressure to follow it up today. The 17 crew fell behind on the first leg and trailed for most of the race before nipping Artemis at the finish by 1 second. Coutts and his BMW ORACLE Racing crew won the bronze medal by defeating Paul Cayard and Katusha by a similar score of 2-0. Coutts and crew held a slim lead at the first windward mark of their second race. After the rounding both boats performed a jibe set to starboard tack, but Katusha had trouble completing the maneuver and had to jibe back to port. That allowed BMW ORACLE Racing to gain control through the rest of the match. In other racing, Cameron Appleton led Team Aqua to fifth place by defeating Ray Davies and No Way Back, 2-0. Rod Davis and Ceeref defeated Markus Wieser and Sea Dubai also by a 2-0 score to place seventh and relegate Sea Dubai to eighth. Racing resumes tomorrow with the commencement of fleet racing. All 13 boats will line up with amateur helmsmen in a series scheduled through Saturday with a maximum of four races per day. 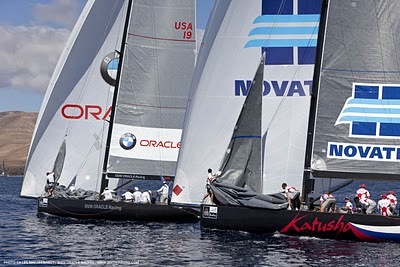 The event can be followed online at the class association’s web site, RC44, and the event site, RC 44 World Championship.